Anyone who loves the harp and likes to hear it carry forward what can be done in "Jazz-Rock" worlds will no doubt be interested in this album Play (Self-Released). 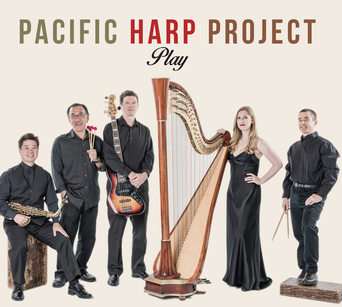 As you can see by the cover image it is by the Pacific Harp Project, a nicely thought-out combination of harp (Megan Bledsoe Ward), vibes (Noel Okimoto), soprano sax (Todd Yukumoto) electric bass (Jon Hawes) and drums (Allan Ward). The music is slightly reminiscent at times of the classic Gary Burton group in their later ECM days, with well done songcrafting (in this case songs by Ward, Okimoto, etc.) and then some that add singer Jamie Ward, and then finally arrangements for this ensemble of music originally composed for other instrumentation by Modern Classical composers (Salzedo, Faure) or not-so-Modern (Handel). Ward is a very good harpist and one hears her with a happy ear if one loves such things. The rest of the band is very good as well. The main thrust is the way everything mixes together and it is a listening that some of the smoothies and new agers might keep on if they heard yet there is substance here and this is not some kind of pablum for the musically challenged. So you who dig the harp, check this out! When times keep going forward we can still think that some things remain constants. One is in "Modern Jazz" of course the importance of great performances, great improvisations. We need look no farther recently to reaffirm this with a new album by saxophonist Ivo Perelman in association in the always vibrant company of Matt Maneri on viola, Nate Wooley on trumpet and Matt Shipp on piano. It is the fourth volume of the new series of recordings Ivo is putting together with a title that explains itself, namely Strings, and to be more precise on this volume Strings 4 (Leo). It is an example of the centrality of the WHO in today's open or Free Avant Jazz gathering. 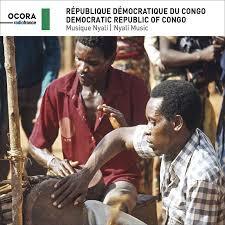 As you listen you know that this particular combination is the defining factor in the aural results. Perhaps it is very obvious but then it still warrants thinking about, in part because it is never so true as in this brand of musical interaction. Truly, every person in this gathering defines the music. First off of course is Ivo himself. He embodies the Jazz Tradition and the Modern-Avant Tradition in very much his own way--with creatively brilliant line weaving that assume all that went before and neither ignores the before nor attaches to it. He simply asserts the moment of his own musical sense at every moment and in weighs the past as it travels to the today-future. Nate Wooley on trumpet does his owning reading of past-present-future too. You might hear a growl that alludes to Bubber Miley perhaps, and it perfectly belongs to the dialog. 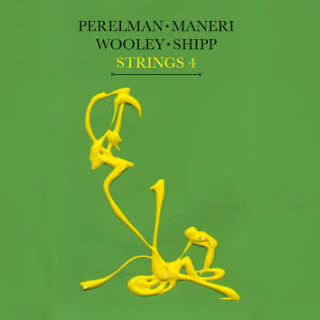 So too Matt Manieri climbs atop what has been and makes of his viola a freely floating, all-encompassing vehicle to express one quarter of the whole. And he does so in ways that go beyond while going within himself too. Matt Shipp is the ideal pianist for a thoughtfully free quartet date like this, because he thrives ever in an open set game. It is what he establishes himself within, as anyone who has followed his trajectory with attention in the last few decades. And in the end it is the moment being right for these four and nobody else that creates ir-reduplicable results.The outlook is radically collective, I suppose you could say. Everybody solos, and so too nobody solos, yet all four come in and out of focus like sun and clouds alternating on a spring day. There are vast swatches of floated note clusters punctuated with passing jabbers and woodchopper's balls hanging suspended then departing as abruptly as they came. This could be thought of as a state-of-the-art example of free improvisation today, as it is that. If you want to check what is up nowadays this to my mind is one you should not miss. Ivo Perelman and this quartet are at the top of their game. Give it a listen by all means. Better late than never when it comes to music that you have not covered because life got in the way. That's how it's been for me with the fine album by Free-Avant Jazz pianist legend Burton Greene and his fairly recent double-CD release Compendium (Improvising Artists 2-CD). 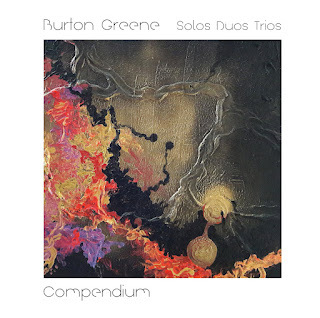 The subtitle Solos Duos Trios tells us what the form is that things take in this wide-ranging and rather brilliant offering of Burton and the workingman's dedicated groups and subgroups he fields on this collection. Burton is of course the constant on piano and he is featured in solo as well as varying duos and trios wit Roberto Haliffi on drums, Stefan Raidl on double bass (for the first CD) and Tilo Raumheier on flute (for the second CD). The emphasis is on how Burton has evolved and keeps going like the formation of a coral reef island where there is a building atop via accumulative developments. So in the course of this program the very free mixes with Monk, with songs and swinging, with compositions and tonal singing. It is a definitive look at Burton as he is now, ever moving forward and worth every moment of your listening time. This is that and anyone who knows and digs Burton's earlier work, does not know it all that well or just loves the piano will find this I think very much a revelation, an absorbing and rewarding thing. I am so glad I have it. That should tell you something? I have been covering the Lisbon Avant Improv Jazz Scene on these blog pages essentially since I began the blog these now pretty many years ago. Fir anybody who has been following it (or are already following what is happening there without aid of this blog) there is a kind of summit meeting of some of the very most important practitioners of the art in Lisbon, the first of what one hopes will be many recordings of the group. They are dubbed LFU or Lisbon Freedom Unity and the album is named Praise of Our Folly (Clean Feed CF 480 CD). It is a set that lives up to the promise of such a gathering. There is Luis Lopes on electric guitar, Rodrigo Amado on tenor, Bruno Parrinha on soprano and clarinet, Pedro Sousa on tenor sax, Rodrigo Pinheiro on piano and Rhodes, Ricardo Jacinto on cello, Hernani Faustino on double bass, Pedro Lopes on turntables and electronics and Gabriel Ferrandini on drums and percussion. And the four-part program makes for the best sort of free improvisation, where all are attuned to one another and listen while also having each an important vision of what they can bring to each moment. Part One sets the stage with a kind of soundscaped panorama, Part Two rockets off to a pointillistic brilliance by the stringed instruments (that includes piano) and drums and on from there, without looking back and taking no prisoners. The horns join in, we launch skywards and there is memorable and riveting sojourns to places far beyond earth. The sound colors are rainbow-like and the collective contributions are far beyond, more than the sum of each individual part, though everyone can be listened to in focus with profit as well. It exemplifies what a larger group can bring to the freedom ringing. In short, this is a summit worthy of the name, a rather monumental adventure that anyone who appreciates free improvisation will respond to. If you want to get a feel for what is happening in Lisbon, or even if you already know, this one is star-full! Yes, indeed. Grab this one! I have followed happily the emergence of Portuguese tenor sax titan Rodrigo Amado from the very first releases. And so the latest one does not surprise me, but very much pleases me, for it is substantial. 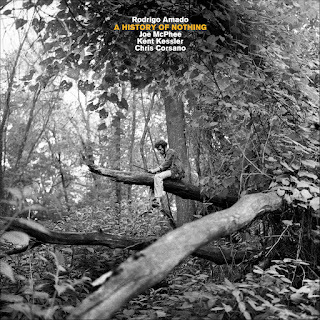 It is entitled A History of Nothing (Trost TR 170), and an insightful history it is. The group is a powerful one, with Rodrigo of course on tenor, the master Joe McPhee on pocket trumpet and soprano sax, Kent Kessler on double bass and Chris Corsano on drums. It is all-star in its musical content as well as name. A gamut of freely alive sound moods surround us, from the open balladic to a high-energy testifying. Rodrigo sounds quite inspired and Joe adds his always exciting front-line contributions, with a bit more trumpet that one usually hears, and that is of course a good thing. Kent and Chris bring up the rhythm end with creative fire. In short, everyone is having a good, a very good session here and it is a kind of monument to how free improvisation in the right hands and at the right time is as awesome as it can get. If you do not know Rodrigo Amado's playing you can start with this one and get a wonderful view of where he is now. Those who know Rodrigo's music already will be very glad to hear this I warrant. It is an excellent album. Do not miss it! Some things strike one as a sort of no brainer. They just make sense. 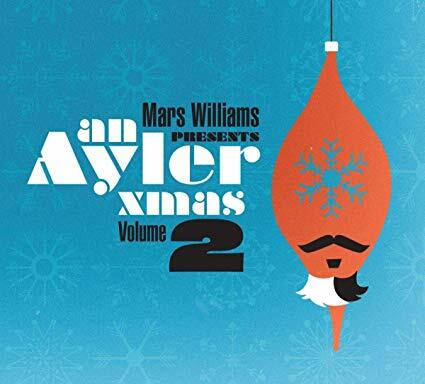 Such is the CD at hand, An Ayler Xmas, Volume 2 (ESP/Soul What SWR-0004). Mars Williams heads up the two ensembles featured on this outing, on saxes and toy instruments. Why a no brainer? As many readers will know Albert Ayler was a tenor saxophonist who was an important guiding force behind the advent of "New Thing" aka "Free Jazz." The thematic bedrock of his melodic launching vehicles as often as not were rather homespun folkish melodies, even at times "Spirituals," straightforward tunes that then opened up to tonal expressiveness to a color palette of brilliant washes of sound, the tenor sax leading the way through mazes of free open expressions, testificatory, soulful flights that were the opposite of the chugging sort of swing feels that much Modern Jazz was at times about. He opened up the possibilities for Jazzmen going forward, so that even Coltrane found himself liberated from chord changes and at times even modalities to instead fly forward into virtuoso inspirations of sound. I have not heard the first volume of this as of yet but this Volume Two revives some Ayler head melodies and some earthy Christmas Carols like "Oh, Tannenbaum" and "Joy to the World," even "O Come Emmanuel" as springboards to avant maelstroms of joy. The two bands are good, very good ones. The first a Chicago-based avant all-star lineup playing live in Chitown, with Mars and Josh Berman, Fred Lonberg-Holm, Jim Baker, Kent Kessler, Brian Sandstrom, Steve Hunt and Jeb Bishop! Then there is a European contingent of Mars plus Thomas Berghammer, Hermann Stangassinger, Didi Kern and Christoff Kurzmann. They are in great spirits as well so there is no drop off in zeal and energy. Hence you who love Ayler will find this to your liking as those who have dug the Chicago-centered NRG Ensemble will as well. It is delightfully off, completely warped and yet breathes joyfully and basks in a holiday glow. Anyone who suspects they would like this, by all means grab it and get it rolling this winter and for years to come! It's going for cheap out there from what I see. Bravo!